When providing guidance on the selection and use of PPE, it is critical for occupational safety and health experts to understand not only the technical issues surrounding the use of PPE as an exposure control method, but also the regulatory compliance burden placed on the employer. I recognize that just complying with OSHA standards is not equivalent to meeting industry best practices, but is important to understand the what might be considered the back-bone of PPE programs in the US. In February, OSHA announced the publication of an update of  Enforcement Guidance for Personal Protective Equipment (PPE) in General Industry. This update establishes OSHAs general enforcement and guidance policy for its Standards addressing PPE. 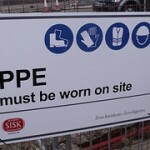 The PPE Standards had been revised by OSHA in 2007 and 2009. These changes had not been reflected in the former enforcement Instruction. Clarification of payment requirements for PPE worn off the jobsite, for PPE that must remain at the jobsite, and for employee-owned PPE. Who: Employers must provide PPE to all affected employees with an established employer-employee relationship. These employees include short-term employees which may be referred to as temporary employees, piece workers, seasonal employees, hiring hall employees, labor pool employees, or transient employees. What: Employers must pay for PPE that is required to comply with OSHA Standards, except in the limited cases specified in the Standards. Employers must provide, at no cost to employees, the PPE that is necessary to protect against the hazards that the employer is aware of as a result of any hazard assessments required and specified in the OSHA standards. An employer must provide, at no cost to employees, upgraded PPE that the employer chooses to use to meet OSHA PPE requirements. Which: OSHA is updating the references in its regulations to recognize more recent editions of the applicable national consensus standards, and is deleting editions of the national consensus standards that PPE must meet if purchased before a specified date. In addition, OSHA is amending its provision that requires safety shoes to comply with a specific American National Standards Institute (ANSI) standard. those highlighted in red are not required to be purchased by the employer. Non-specialty gloves for protection from dermatitis, severe cuts/abrasions.